Acknowledged author David S. Ballantine wrote Fundamentals of General, Organic, and Biological Chemistry, Books a la Carte Plus MasteringChemistry with eText -- Access Card Package (8th Edition) comprising 9998 pages back in 2016. Textbook and etextbook are published under ISBN 0134261259 and 9780134261256. 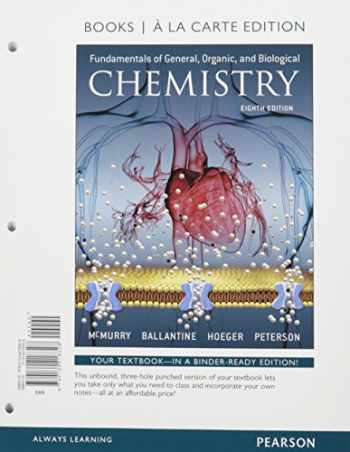 Since then Fundamentals of General, Organic, and Biological Chemistry, Books a la Carte Plus MasteringChemistry with eText -- Access Card Package (8th Edition) textbook was available to sell back to BooksRun online for the top buyback price of $81.82 or rent at the marketplace. NOTE: This edition features the same content as the traditional text in a convenient, three-hole-punched, loose-leaf version. Books a la Carte also offer a great value—this format costs significantly less than a new textbook. Before purchasing, check with your instructor or review your course syllabus to ensure that you select the correct ISBN. Several versions of Pearson's MyLab & Mastering products exist for each title, including customized versions for individual schools, and registrations are not transferable. In addition, you may need a Course ID, provided by your instructor, to register for and use Pearson's MyLab & Mastering products. For courses in General, Organic, and Biological Chemistry (2 - Semester) This package includes MasteringChemistry™ A Clear, Flexible Approach to Chemistry for the Modern Classroom Active learning, an increased focus on clinical examples, updates based on current teaching and research findings, and digital innovations designed to engage and personalize students’ experience make Fundamentals of General, Organic, and Biological Chemistry simply the best choice for students with a future in allied health. With the Eighth Edition, the authors make learning chemistry a more active experience through features designed to get students doing chemistry. Every chapter features Hands on Chemistry sections that deepen students’ understanding of chemistry by having them perform elementary experiments with everyday household items. Group Problemsat the end of every chapter are designed for in-class use and motivate students toward higher level thinking, such as how concepts fit together and how to apply these concepts in a clinical application. All of the chapter openers, including many of the Chemistry in Action boxes and end-of-chapter problems, have been rewritten for a stronger clinical focus that provides more relevance to allied health majors. All content has been updated for the modern classroom with special attention to the biochemistry chapters, making the Eighth Edition of Fundamentals of General, Organic and Biological Chemistry the best choice for future allied health students. This edition is fully integrated with MasteringChemistry to provide an interactive and engaging experience. Media resources include narrated Video Tutor Solutions for every book chapter that present how to work the most challenging problems and feature additional feedback and instruction from contributor Sara Madsen. NEW in MasteringChemistry is the Chemistry Primer, a diagnostic and remediation tool that provides a pre-built assignment designed to get students up to speed on Chemistry and Math skills at the beginning of the course so they come to class prepared to delve more deeply into topics. Personalize learning with MasteringChemistry MasteringChemistry is the leading online homework, tutorial, and assessment system, designed to improve results by engaging students before, during, and after class with powerful content. Instructors ensure students arrive ready to learn by assigning educationally effective content before class, and they encourage critical thinking and retention with in-class resources such as Learning Catalytics™. Students can further master concepts after class through traditional and adaptive homework assignments that provide hints and answer-specific feedback. The Mastering gradebook records scores for all automatically graded assignments in one place, while diagnostic tools give instructors access to rich data to assess student understanding and misconceptions. Mastering brings learning full circle by continuously adapting to each student and making learning more personal than ever—before, during, and after class.